The role of a manager is very crucial in any organization and he/she plays a significant role in managing the day-to-day activities of the organization. A manager also plays a major role in the decision-making procedures of the organization. 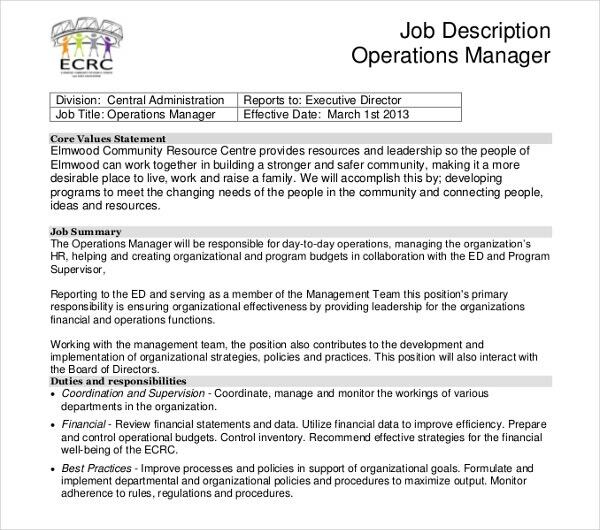 You may also see Job Descriptions Examples. The contribution of a manager is immense as he acts as the driving force behind a business concern’s success and enhancing profits. 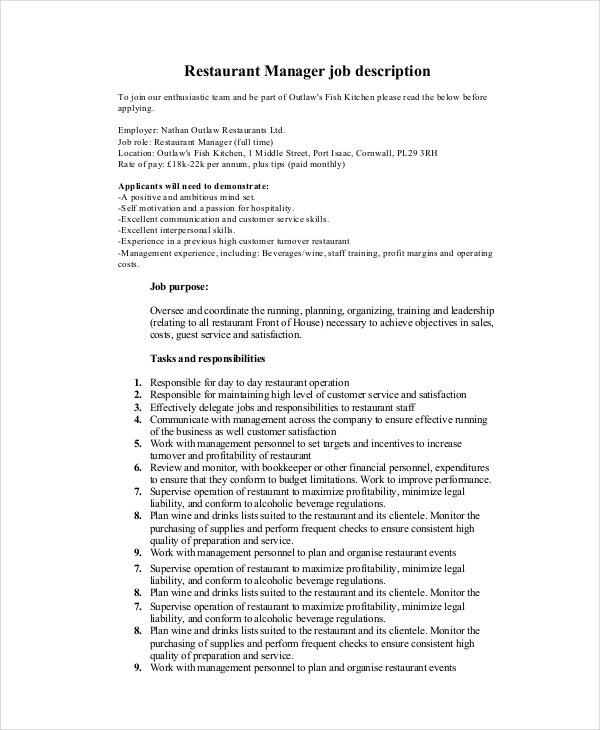 The Manager Job Description Templates as mentioned below will assist you in crafting Job Descriptions Samples that will attract the right set of candidates who are eligible for the job. A project manager in an IT firm oversees and coordinates the planning and execution of a running project, and he/she is accountable for the project to be completed in an efficient manner and that too within the specified deadline. 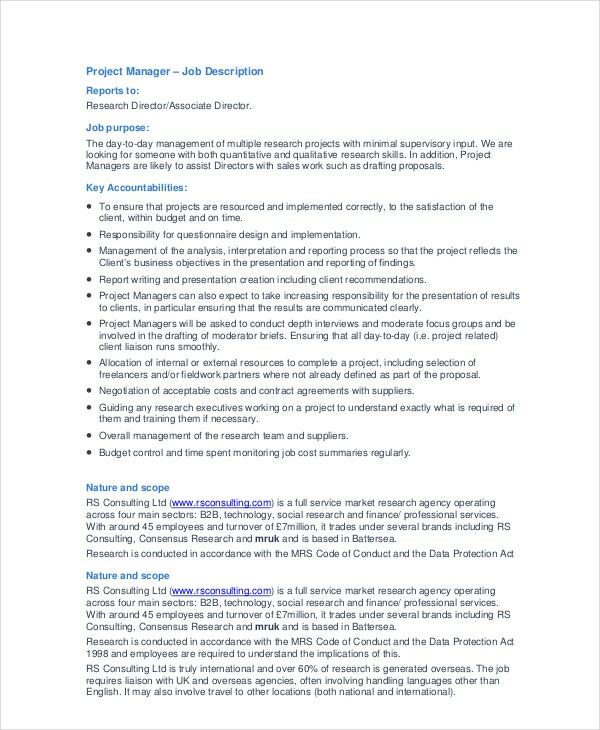 This project manager job description will offer you more clarity on the role of a project manager. 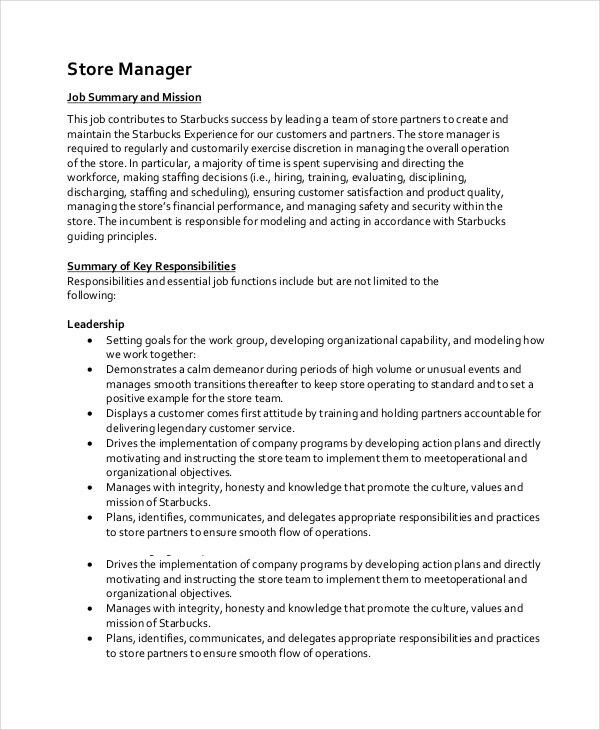 The job of a store manager is to look after all activities of the store or outlet like recruiting new employees, managing the existing employees and assigning them duties, communicating with suppliers, handling customer complaints, etc. 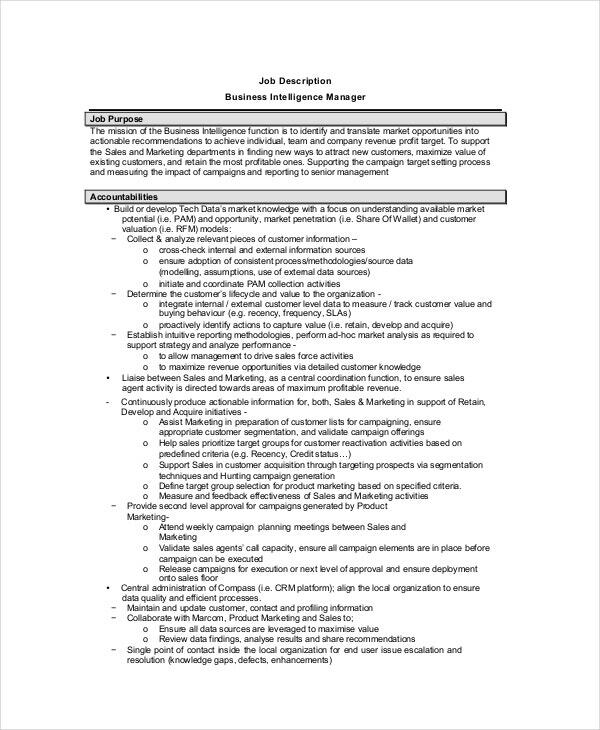 The Store Manager Job Description explains all this and much more. 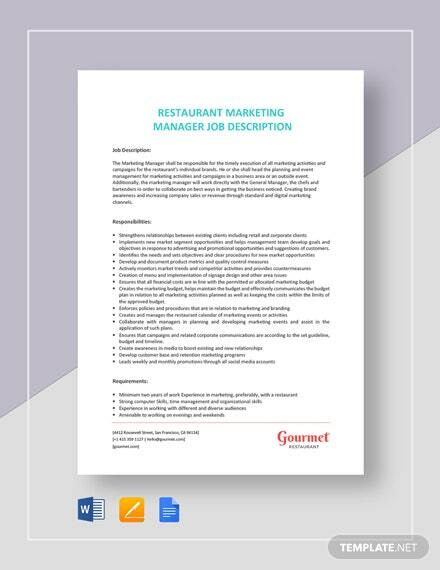 If you are looking for a job description template that you can use to hire a manager for your restaurant, this Restaurant Manager Job Description will be an ideal choice for you. 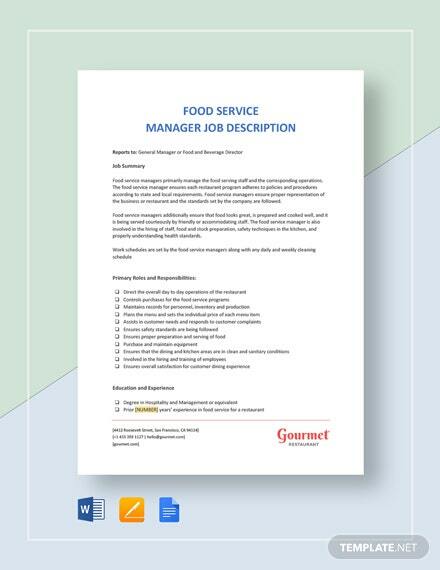 All the roles and responsibilities of a restaurant manager have been explained clearly mentioned in this template that you can use. The general manager of a restaurant plays a crucial role, and he/she oversees and coordinate the planning, organizing, and training activities. He/she ensures the restaurant achieves its stated objectives through his/her leadership. He/she also takes care of sales, costs, profitability, employee retention and much more. Go through the template to get more information. 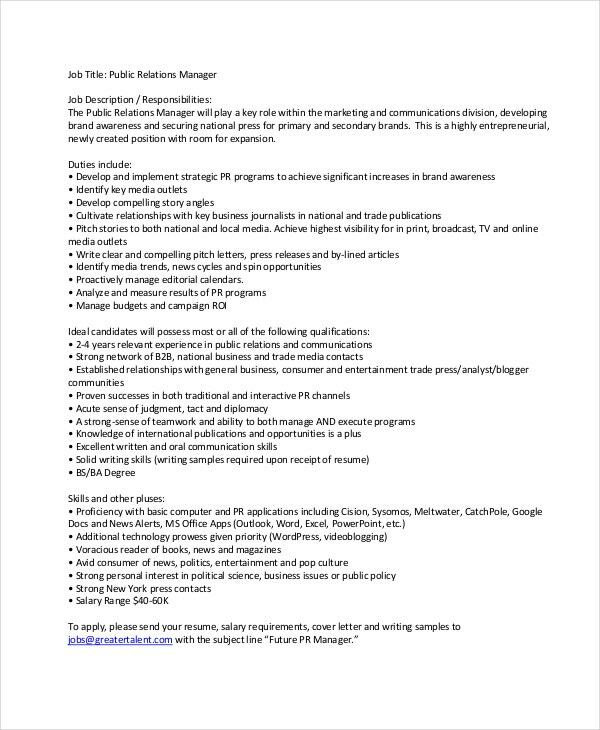 You may also see Program Manager Job Description. 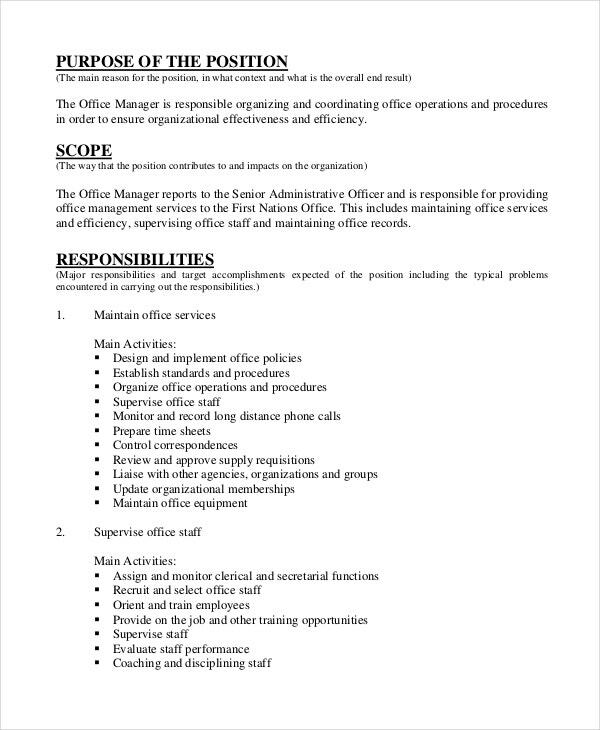 The office manager is responsible for organizing and coordinating office operations and procedures so that the organization can run smoothly and achieve its goals and objectives. 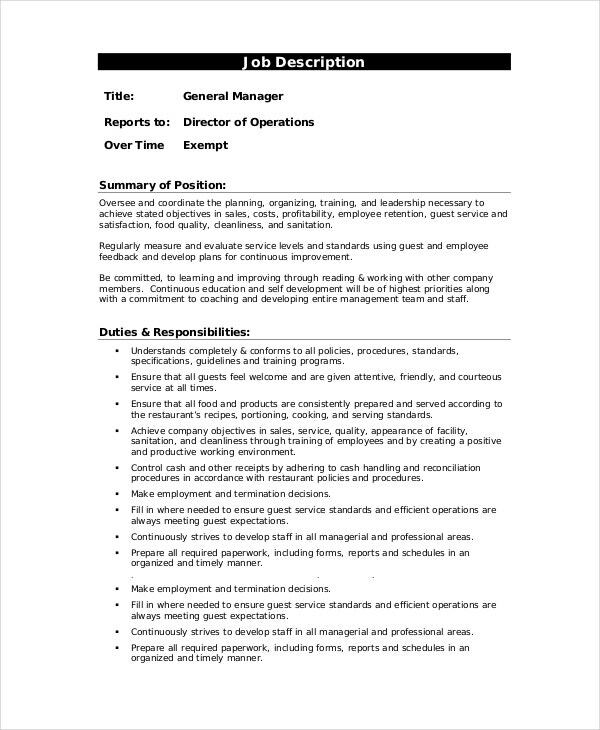 This is a perfect template if you are looking for an Office Manager Job Description template. 1. 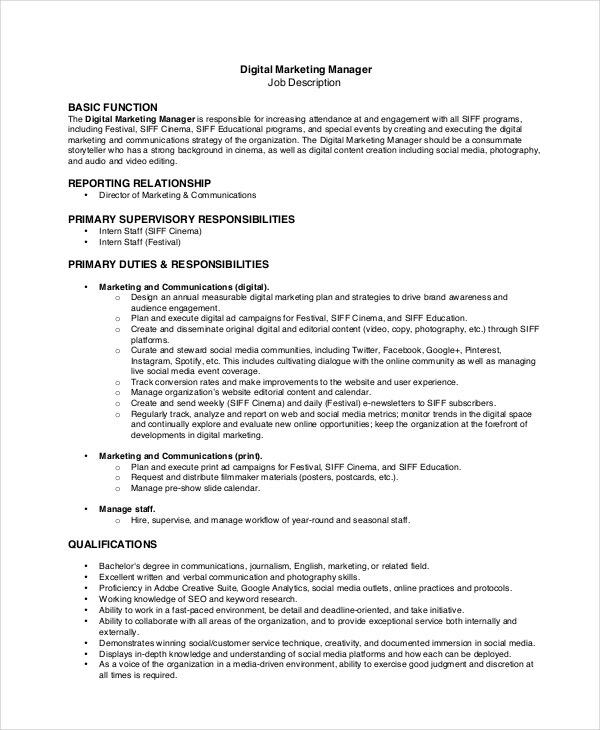 What are the uses of these Manager Job Description Samples? The market is teeming with qualified and skillful personnel who will be able to play the role of managers, but due to lack of proper advertisement, various organizations have to deal with amateurs. 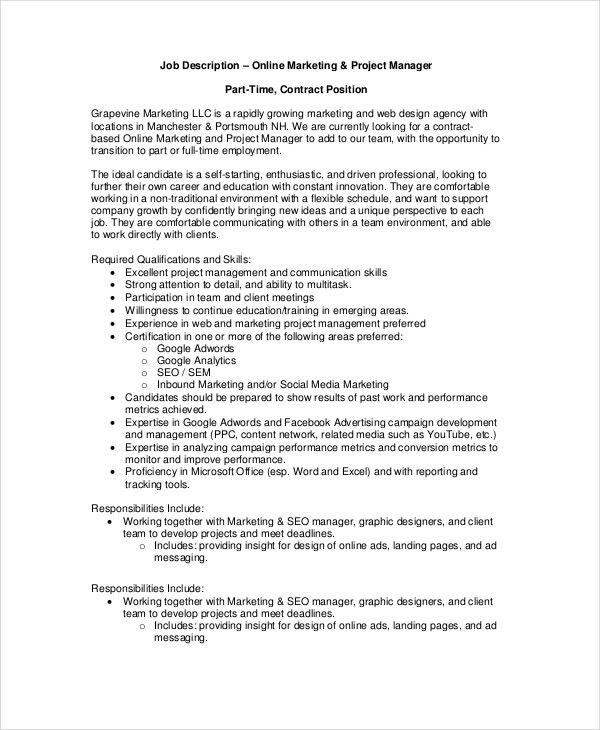 You can use the Marketing Manager Job Description Templates as mentioned above to advertise a vacancy for the job of a manager. This will help you in getting in touch with the right set of candidates, and it will save your time and energy too. By going through the job description, the candidates could assess themselves before coming for the interview. 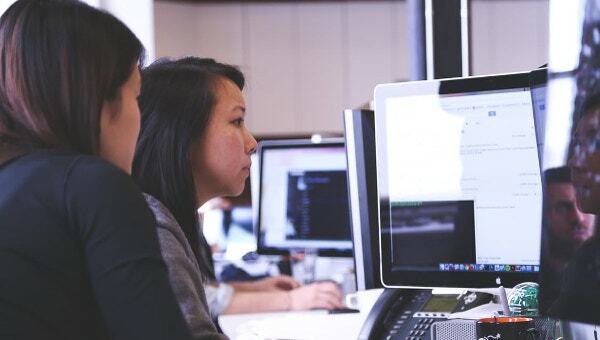 Use these templates as they will make your recruitment process a lot more effective. 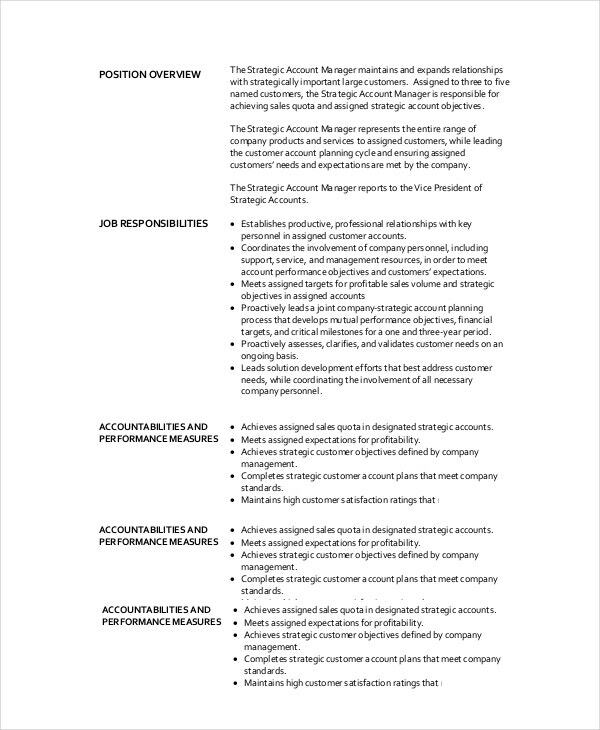 2. Who can use these Manager Job Description Templates? The Manager Job Description Samples as mentioned above are aimed towards organizations who want to hire managers with requisite qualifications and experience who will be able to fit into the role and take the organization forward while helping in managing their day-to-day operations. These job description examples can be used by the aspiring managers as well. These will give them a clear idea about the various roles and responsibilities that they will have to perform if they get selected for the role of a manager. This will help the organizations immensely as they don’t have to draft a manager’s job description from scratch. They can use these templates to a good effect. 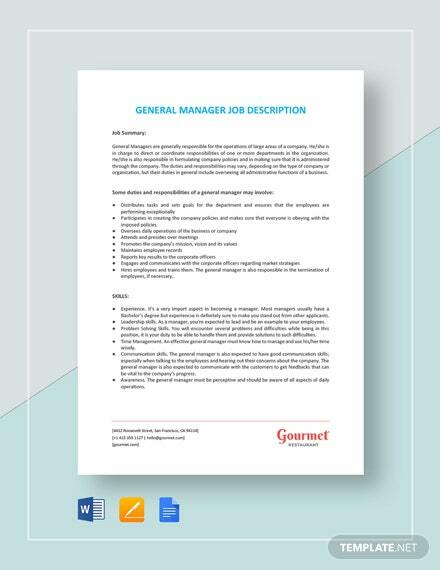 We have a vast collection of General Manager Job Description templates that you can select from. 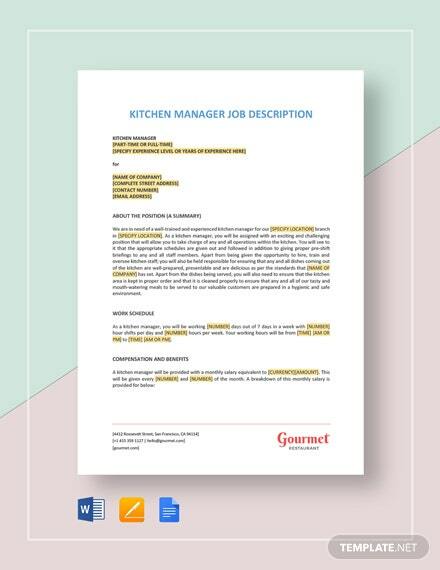 The templates are fully customizable, and all you need to do is add the necessary information in the template and use it for your recruitment purpose. Use these templates as a guide for creating a job description to hire qualified candidates for the role of managers.